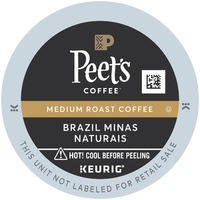 Peets Coffee Brazil Minas Naturais GMT6542 $16.59 Coffee features Brazil's finest beans from the region of Minas Gerais. Coffee uses dried whole coffee cherries to provide a sumptuous sweetness. K cups are designed for use in Keurig coffee brewers.